Here comes The Hamwich Shack! This fast food stop is offering a better burger and sandwich for the community to chomp on. It’s no revelation that South L.A. is overloaded with fast food restaurants with few healthy alternatives. Although a wave of change is slowly sweeping through parts of the community with the Crenshaw/LAX line, two men have taken it upon themselves to bring better eating to the Watts community right now. “Gourmet Hamburgers and sandwiches,” added Manager David “Hollywood” Harrell about their new drive-thru eatery. 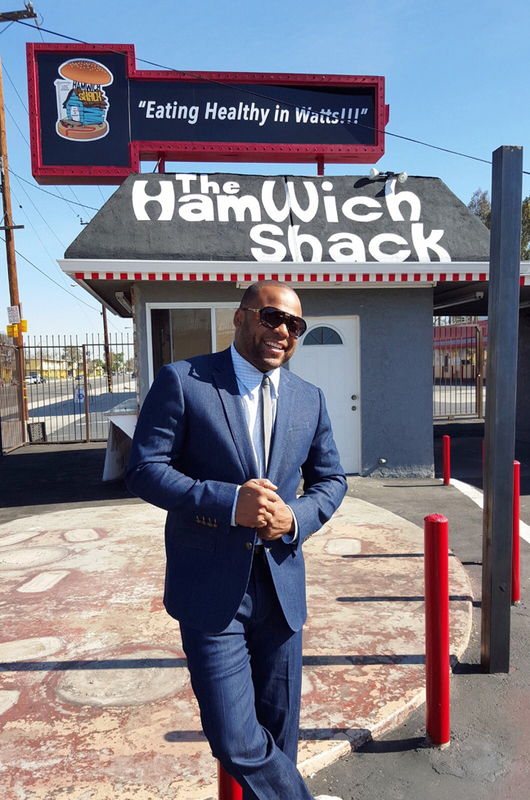 Harrell and Harris are business partners running the Hamwich Shack (HS), which was established in North Hollywood seven years ago, that location having closed. Harrell and Harris wanted to bring their establishment to an area underserved when it came to healthier food options. “We just wanted to bring a different, alternative food to our community,” said Harrell. The menu, which is mostly under wraps until their grand opening, was inspired by Harris’ travels locally and abroad. Their meats are all natural with no hormones, GMOs, antibiotics and one other very interesting change that sets them apart from other fast food restaurants. “We don’t have anything against people that eat pork but we’re not selling any type of pork at the Hamwich Shack as well,” said Harrell. The co-owners gave the Sentinel an exclusive on two of their menu burgers: the Jive Turkey Burger, with a turkey pattie, turkey bacon and turkey chili and the Cracked Pepper Turkey Sandwich. One of their sides includes a top secret coleslaw as well as three-to-four different kinds of French fries to choose from. There is one thing that both Harrell and Harris want the community to know about the Hamwich Shack is that it’s more than a fast food alternative. In the summer, they will start a program called Tutoring in the Lot, where youth will be able to come to the Hamwich Shack and learn about eating right and improve their academic skills. “We have to start with the kids first,” said Harrell. Harrell and Harris invite everyone, from the community to elected officials to come out to their grand opening on Saturday, February 13. Ultimately, their hope is to put a Hamwich Shack in all underserved and low income areas in SoCal and beyond. The Hamwich Shack opens Saturday, February 13 at 10AM located at 1330 East Imperial Hwy in Los Angeles, CA 90059. You can follow the Hamwich Shack on Facebook, Twitter and Instagram.